Prof. Joycie Dorado-Alegre, Director of the Leyte-Samar Heritage Center, delivering her welcome remarks. Stickers and key chain given away to all participants. The Sinirangan Bisaya Wikimedia Community (SBWC) in cooperation with the Leyte-Samar Heritage Center (LSHC) of the University of the Philippines Visayas Tacloban College (UPVTC) conducted the 6th Waray Wikipedia Edit-a-thon, an event in which people come together in a place to collaboratively contribute to online projects such as but not limited to Waray Wikipedia, at the Multipurpose Building, University of the Philippines Visayas Tacloban College, Magsaysay Boulevard, Tacloban City, Leyte from November 18 to 19, 2016. This edit-a-thon was funded by generous donors. Two Wikimedia volunteers from Manila served as resource speakers and assisted in the conduct of the wiki editing activity. The LSHC of UPVTC provided the venue and invited participants for the event. This is the second edit-a-thon hosted in Tacloban City. The first one happened last July 2015 at the Legislative Building in Tacloban City. This edit-a-thon is unique among other edit-a-thons done in Eastern Visayas because this is the first time that it was a two-day event and was held at a university. Previous edit-a-thons were done only within a day and not at a university. Determination of winners was also different. Winners were judged based on the quality of the articles they have written instead of the usual number of characters contributed. Even so, this edit-a-thon produced the most number of characters contributed in any documented edit-a-thon conducted in the Philippines as of November 2016. Upon generating 66,366 characters, it has beaten the August 2014 Pangasinan Wikipedia Edit-a-thon, which contributed 63,381 characters only. An edit-a-thon at the UPVTC was first proposed by Michael Glen U. Ong, SBWC coordinator and administrator of Waray Wikipedia, during a meeting with some university faculty and students on November 21, 2014. Prof. Joycie Dorado-Alegre, director of LSHC of UPVTC, agreed to it and encouraged SBWC to submit a proposal for the edit-a-thon. Michael persistently followed up Prof. Joycie but a definite schedule could not be set. In June 2016, the SBWC met with Prof. Joycie and finalized a date for the edit-a-thon on November 2016. With a confirmed schedule, Michael once again tapped veteran Filipino Wikimedians Jojit Ballesteros and Bel Ballesteros to give talks and facilitate the edit-a-thon. Prof. Joycie gave the welcome and closing remarks as well as served as one of the judges, with the assistance of Rachel Jereza-Pabro, in deciding who among the participants have done well in the edit-a-thon. In addition, she also invited her students as participants for the event. Even before the edit-a-thon, she instructed her students to prepare encyclopedic articles in Waray language with references, which would be uploaded to Waray Wikipedia during the edit-a-thon. Michael also served as judge with Prof. Joycie and Rachel. Setting-up the venue and sound system was done by UPVTC personnel. During the lecture, aside from explaining the basics of Wikipedia editing, Bel and Jojit also presented the mobile version of the Offline Waray and English Wikipedias through a demonstration using an Android smartphone and an Android tablet. They also informed the audience that Wikipedia in any language versions could be downloaded for offline use through Android and Windows applications, as well as iOS application made by Kiwix. Unlike most of the previous edit-a-thons in Eastern Visayas, participants in this event were not grouped and all of them contributed on their individual efforts. They all edited and added content in the Waray Wikipedia and one person edited articles in the English Wikipedia. Two participants created two articles each but only their first created articles were accepted as their entry for judging. 11:30 am Start of edit-a-thon Meals were distributed around 12:00 pm and participants continue to edit while lunch was served. There was no formal lunch break and the whole project team assisted and guided participants during the edit-a-thon. 5:45 pm Presentation of plaques of appreciation Michael Ong SBWC had given plaques of appreciation to Prof. Joycie, Jojit Ballesteros and Bel Ballesteros. 6:15 pm Closing remarks and presentation of tokens Prof. Joycie Dorado-Alegre LSHC had given tokens to Michael Ong, Bel Ballesteros and Jojit Ballesteros. On the first day, there were a total of thirty-three (33) students who participated in the lecture given by the Ballesteros couple. On the second day, only twenty-three (23) students returned, all of which were able to create their own Wikipedia account. Of these, only twenty (20) students contributed new articles or at least edited existing articles. After the edit-a-thon ended on 3:00 pm, two students left the venue. All the students are taking up BA Communication Arts in UPVTC. Prizes were given to the top seven (7) students based on their average scores. Top four to seven, whose average scores ranged from 75% to 90%, won Offline Wikipedia DVDs of both English and Waray language editions. The top three winners of the edit-a-thon, whose average scores were above 90%, each won a USB flash drive containing Offline Wikipedias of both English and Waray language editions. Having average scores ranging from 78% to 94.5% means that the winners produced high quality outputs in terms of having reliable and verifiable sources, broadness in scope, neutrality and being well-written. The fourth place winner, Pamela Kate Almo, was not able to receive her prize personally because she left the venue after the edit-a-thon proper. Jamie Evangelista, who was also the first place winner, received the fourth place prize on her behalf. All second day participants received certificates of attendance and tokens (stickers and key chains). and Tiyanak 70.5% Created two articles; "Ekek" was considered for judging. and Pagmayaw 28.5% Includes edits done by 111.125.81.252; created two articles. "Homonhon" was considered for judging. Allaine Ruth Antoni Les Ruth Female Was not able to create an article on time and the contribution was not counted because it was published on the user namespace. Having dialogues/meetings with partners beforehand, in this case the LSHC of UPVTC, helped establish this collaboration. The series of communications and persistent follow-ups before the event greatly helped in gaining ideas and information on how to conduct this event. The edit-a-thon was well attended because the partner organization, the LSHC of UPVTC, was interested in the activity. As requested by the coordinator, partners were able to invite students and helped in innovating the mechanics of the edit-a-thon by orienting the students/participants and making them prepare encyclopedic articles beforehand to be uploaded to Waray Wikipedia during the actual edit-a-thon. Aside from this, due to interested participants, the edit-a-thon was able to produce more than 66,000 characters of content, which is the largest number of characters contributed in any documented edit-a-thon in the Philippines as of November 2016. It was good to have helpful and cooperative partners that provided necessary facilities and support. Incidentally, the LSHC of UPVTC through the efforts of Prof. Joycie Alegre invited the participants and provided venue. There is at least one participant who continued to edit Wikipedia after the event. For the first time, the Waray Wikipedia Edit-a-thon was held at a university. It was one of the things that SBWC was wishing for since the first Waray Wikipedia Edit-a-thon. Although the venue was not a computer laboratory, the students brought their own laptop as advised by Prof. Joycie. Because of that, students were able to edit and create articles individually instead of in groups, which were done in previous edit-a-thons. All participants are students of BA Communication Arts who are very much interested in writing and Wikipedia. They were excited to see their outputs online. This edit-a-thon became innovative because the winners were determined by the quality of their works instead of the number of characters they contributed. Participants were able to contribute twenty-two (22) new articles in the Waray Wikipedia including some that are of good quality based on having reliable and verifiable sources, broadness in scope, neutrality and being well-written. On the second day during the actual edit-a-thon, although internet connections were provided by the university and the project team as well as through individual pocket internet Wi-Fi brought personally by students, there were times that internet connectivity were slow and intermittent. To continue with their work, some students wrote their articles on a word processor software and transferred it later to Wikipedia when internet connection was stable. On the first day, the event started late because some students were still attending classes. This is in spite of them being excused from class to attend the event. Moreover, there were thirty-three (33) students who attended the first day but only twenty (23) returned on the second day. Among those twenty-three participants, not all participated in the actual edit-a-thon. Although the event was scheduled to be from 8:00 am to 5:00 pm for two consecutive days, unforeseen circumstances made the first day lasted up to 12:10 pm only. The main focus of this project is to increase quality contributions to the Waray Wikipedia, which includes creating and editing articles. Aside from writing articles in Waray Wikipedia, the participants may also add content to other Wikimedia projects such as, but not limited to, uploading pictures to Wikimedia Commons and enhancing Waray-related articles in other language versions of Wikipedia. Participants were able to contribute mostly to the Waray Wikipedia and edit a few articles in the English Wikipedia. The first goal is to have at least fifteen (15) participants attending each day of the event. This was achieved because thirty-three (33) persons attended the first day while twenty-three (23) persons attended the second day of the event. All of the second day attendees created user accounts but only twenty (20) of them created and edited articles during the actual edit-a-thon. All of the attendees of the two-day edit-a-thon are all newbies or new to Wikipedia. The second goal is to have at least 30,000 characters contributed in the Wikimedia online projects. This was achieved because participants contributed a total of 66,366 characters. Incidentally, as of November 2016, this is the most number of characters contributed in any documented edit-a-thon in the Philippines beating the August 2014 Pangasinan Wikipedia Edit-a-thon, which produced 63,381 characters. The third goal is have at least five (5) quality articles having average scores 80% and above based on the criteria set by the project team. This was achieved because there are exactly five (5) articles averaging above 80%, three of which are above 90%. The highest average score was made by a female named Jamie Evangelista (User:Jamiebve) who got 94.5% for her article about the founder of Opus Dei, Josemaría Escrivá de Balaguer. There should be at least 15 participants attended the on each day of the event. Excluding the project team and organizers, thirty-three (33) participants attended on the first day while twenty-three (23) attended the second day. Although, only twenty (20) attendees who participated in the actual edit-a-thon The LSHC of UPVTC through the efforts of Prof. Joycie Alegre helped in bringing in participants for the edit-a-thon. There should be 30,000 characters or equivalent to approximately 20 pages of printed text added in the Waray Wikipedia and other Wikimedia-related projects. There are 66,366 characters contributed mostly in the Waray Wikipedia and a few in the English Wikipedia. The participants were actively participating in the edit-a-thon. They are BA Communication Arts students who are interested in writing. There should be at least five (5) quality articles averaging above or equal to 80% based on the judging criteria set by the project team. There are exactly five (5) articles that have scores averaging above 80%, three of which are above 90%. Unlike with most of the previous edit-a-thons in the Eastern Visayas, students were individually focused on creating the article of their choice. This made the edit-a-thon produced quality new articles. 1. # of active editors involved 0 All the participants were first time to be familiar with the wiki editing process. There were two active Wikipedians present during the event but they are part of the organizing team. 2. # of new editors 23 All of those who attended the second day registered an account but only twenty (20) persons contributed content excluding one person who contributed past the cut-off given by the project team. 3. # of individuals involved 33 This excludes the project team. Including them will increase the number of individual involved to 40. 4. # of new images/media added to Wikimedia articles/pages 0 No one uploaded new pictures in Wikimedia Commons but some reused existing ones to their articles. 22 new articles created The total edit count is equal to one hundred thirty-six (136). Among the edits, participants added twenty-two (22) new articles. 6. Absolute value of bytes added to or deleted from Wikimedia projects approximately 66,366 bytes This was tallied during the event. This does not include deleted content because the organizing team did not tallied it during the event. 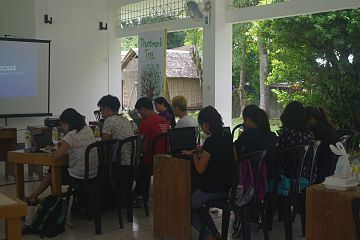 In this edit-a-thon, participants focused their attention on creating quality articles in the Waray Wikipedia. The project team decided to determine the winners of edit-a-thon by judging the output of the participants through a set of criteria, which was loosely based on the criteria set by the English Wikipedia for good articles. The criteria for judging can be seen in the "Actual event" section of this report. This is the first time that an edit-a-thon in the Eastern Visayas was focused on quality rather than quantity or number of characters contributed due to the following reasons: (a) the participants were oriented by the partners beforehand therefore they were ready to create their contributions during the event; (b) to improve the conduct of the edit-a-thon; (c) to encourage the students/participants to enhance their research abilities, critical thinking and writing skills; and (d) to enrich the content of the Waray Wikipedia which is being criticized for not having enough quality articles despite having more than 1.2 million articles. The participants created a total of twenty-two (22) new articles with various topics. Based on the judges' scores, the top three articles can be considered as good quality articles, top four to ten articles as either B-class or C-class articles and the rest of the contributions as either start class or stub class. (See the assessment grades of the English Wikipedia for explanation of article classes.) With twenty-two new articles, the result of this edit-a-thon may seem insignificant but this endeavor could become the start of improving articles in the Waray Wikipedia. The Waray Wikipedia editing community can use the results of this edit-a-thon as their benchmark for creating and assessing articles in the Waray Wikipedia. Likewise, adding twenty-two new articles by people who are new to Wikipedia is quite an achievement and aligned to the Wikimedia Movement's vision that everyone could "share to the sum of all knowledge." In the Wikimedia Movement, contributors are mostly male-dominated and the movement is trying to encourage more female contributors. It is worth mentioning that this event had somehow narrowed the gender gap. One of the two resource speakers is a female while two of the three judges are female. Nineteen (19) out of the twenty-three (23) attendees of the second day of the event are female and five (5), including the first placer, out of the seven (7) winners are also female. The project team did not able to get the genders of the first day attendees totaling thirty-three (33) people but based on those who returned on the second day, it is still overwhelmingly attended by female participants. Offline Wikipedias in Waray and English languages stored in DVDs and USB flash drives that were given away as prizes for the winners of the edit-a-thon. The logo of UPVTC near the Multipurpose Building where the edit-a-thon was held. Michael of SBWC with the project team awarding the plaque of appreciation to Prof. Joycie. The top three winners with Prof. Joycie and the project team. This page was last edited on 2 November 2018, at 19:34.